We believe that projects best embody the spirit and vision of the client when the design process is creative, interactive and fun. We employ several techniques to ensure broad participation from the staff and users in a context of teamwork and camaraderie. We will work with you to determine which of these activities best suit the programming process to discover and understand your mission, vision, and values. What results is buzz and momentum in the constituency, unity around core values and strategies, equipped ambassadors for the project, and fuel for the design team and leadership. This event brings a wide spectrum of the stakeholders together for a 3-hour creative session that uses collage-making to build bridges of communication between participants. 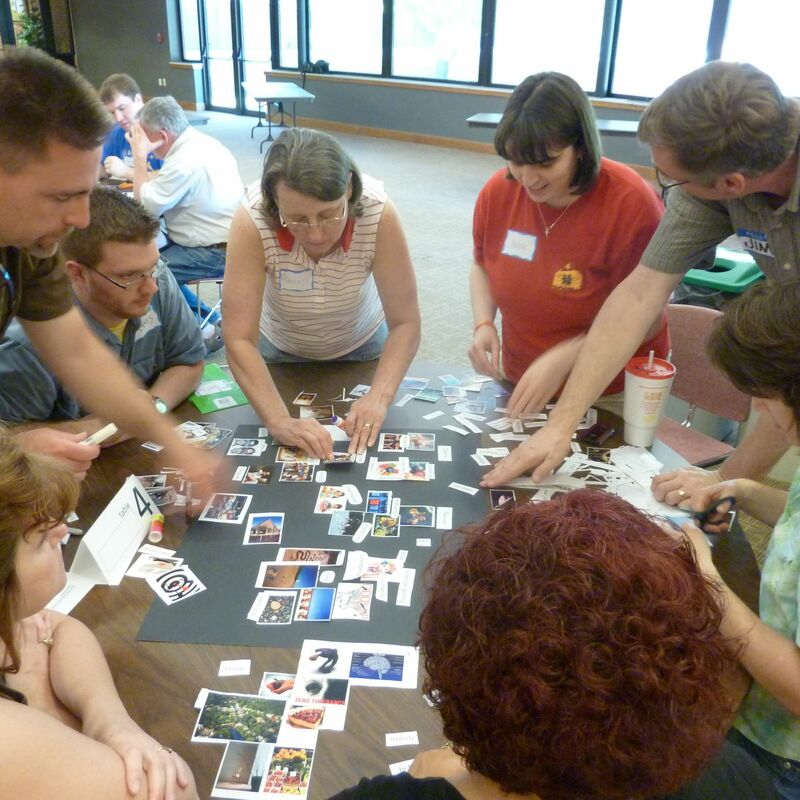 Groups of 6 to 8 people combine pictures and words cut from worksheets to create collages that answer questions about your mission, vision, and values as they relate to the building project. The combination of pictures and words creates surprising insights that stimulate dialogue among and between groups and builds consensus toward project goals. Most people have a hard time describing the desired character and features of a space. The words never seem to capture the intended message. In order to bridge that gap, we provide participants with a carefully selected collection of images depicting a variety of examples of completed spaces representing each program element or functional area. Individuals are asked to identify appealing features (What’s Hot?) and unappealing features (What’s Not?) and to compare the effectiveness of the various spaces depicted. In this way, participants can use visual cues to address aesthetic and functional preferences without being limited to verbal descriptions. We mingle with staff and users in a variety of settings to observe a day in the life of the church by worshiping, participating, and photographing activities and the unstructured times between activities. Not only does this provide an immersion in the church’s culture, but it also exposes logistical issues and circulation bottlenecks. Nobody knows the logistics of ministry like the ministry teams themselves. We bring them together to roll up their sleeves and get creative. Starting with responses to a qualitative and quantitative questionnaire previously distributed to ministry leaders and volunteers, participants work with us to determine optimal sizes and relationships for each required space, and then sketch out conceptual layouts illustrating how those spaces will function, look, and feel. You’ve heard of “brainstorming.” Well, braindrawing and brainwriting are fast-paced, interactive sessions with children and youth to discover their ideas about their ministries spaces. With braindrawing, younger children are asked to produce quick sketches in response to questions about their ideal ministry space followed by a “shout-out” session in which the children respond to the ideas generated. Brainwriting is used with older children and teens creating architectural “graffiti” on large rolls of paper, sometimes in response to images we’ve provided. Again, a session concludes with a shout-out. Controlled mayhem, fun and revealing!